French explorers under Robert de La Salle intended to reach the mouth of the Mississippi River, but missed it by over 400 miles. In 1685, they constructed Fort Saint Louis in what is now known as Inez, Texas, after landing at Matagorda Bay. Although the colony – 15 miles north of present-day Victoria – proved to be a tremendous failure, La Salle’s venture set the stage for one of Texas’s earliest settlements. Situated between Houston, San Antonio, and Corpus Christi on the Guadalupe River, Victoria’s location near the Gulf of Mexico and larger cities has made the city ideal for commerce, agriculture and later, oil. After the French debacle, Spaniards built forts and missions in the area to protect from foreign settlers and to convert natives. Empresario Martín De León laid out Victoria in 1824, naming it in honor of the first president of Mexico. After the Texas War of Independence, it was incorporated under the Republic of Texas in 1839 and by 1850 was home to nearly 1,000 people. The influx of immigrants to the area included a number of Jews, who quickly established themselves as bankers, merchants and retailers. Although likely comprising never more than 150 individuals in Victoria, Jews were key figures in the city’s history and continue to influence life at the “Crossroads of South Texas” into the present day. Possibly the first Jew to settle in Victoria – and easily the most prolific – Abraham Levi was born in 1822, the youngest son of poor Alsatian parents. Levi left unfavorable conditions in France for New Orleans in 1846. After brief stints working in a brickyard, butcher shop and selling small merchandise, he moved upriver to Natchez, Mississippi, and then to nearby Liberty. Levi found employment under a merchant named A. Schwartz, advancing quickly. With faith in Levi’s strong work ethic and sensing business opportunity, Schwartz’s brother-in-law, Jacob Halfin, lent $3,000 to Levi and Halfin’s brother Henry to purchase dry goods and set up shop in Victoria. 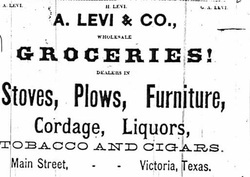 Whether Levi’s exact date of arrival in Victoria was in 1848 or 1849 is unclear, but an advertisement in the Texian Advocate on October 17, 1850 establishes that Levi and Halfin were already engaged in merchandising “winter boots and shoes and a good assortment of Groceries, Provisions and Liquor,” selling their wares out of the west wing of the Globe House, a hotel. The purchase of a Jewish cemetery lot in Victoria’s newly created Evergreen Cemetery in 1850 reflects an early Jewish stake in the community. Raphael Halfin, who died in January 1856, is likely the cemetery’s oldest grave. Levi married Mina Halfin, Henry’s sister. Jacob Halfin, Issac Schwartz and Moses Schwartz, with whom Levi had worked in Liberty, joined the partnership in Victoria upon hearing of their success, forming Halfin, Levi & Company. Henry withdrew in 1859; however, by 1860, the firm had expanded into one of the largest and most successful retail operations in the region. A fire in 1861 destroyed the block of businesses the store was located on and much of their wares, ending the partnership before the Civil War. 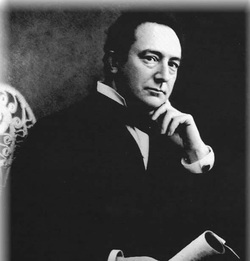 Issac died in 1862, and Moses later established another store with Henry Halfin. Though many had been planted in Southern soil for only a few years, a number of Victoria’s Jews took up arms for the Confederacy following Fort Sumter. Lewis Silverstein enlisted in Company B of the 6th Texas Infantry, which saw action at the Battle of Chickamauga, and attained the rank of lieutenant. Solomon Halfin, son of Jacob, enlisted in the 4th Texas Cavalry, Company C.
Abraham Levi also supported the Confederate government, though his fortunes suffered during the period. After his store burned and Levi failed to collect the insurance – the insurer was a Northern company – he fell ill in 1864 and returned to France to convalesce and settle debts with European creditors. He journeyed home after the war to find his home occupied by a Federal commander. Levi then trekked to New York and collected a portion of the insurance, purchased a large stock of groceries and set up A. Levi & Company, a new partnership and wholesale grocery with a cousin, Henry Levy. Abraham’s descendants are also notable in Victorian history. Godcheaux, the eldest of the Levi family, returned to Victoria in 1869 after graduating from Columbia University. He was treasurer of the New York, Texas, and Mexican Railroad as well as the first president of the Victoria Light, Power & Ice Company. Levi is also noted as the first Texan to establish a scholarship fund and chair for the state university in Austin. He married an Oppenheimer, a local Jewish family, and succeeded his father in running the family bank. Leo Levi graduated from the University of Virginia and settled in Galveston as a lawyer. He was the national president of B’nai B’rith and gave the commencement address at the University of Texas in 1899. Shortly before his death a year later, Leo drafted the Kishineff Petition in 1903, a document addressed to Czar Nicholas II denouncing the pogroms against Russian Jews. It was endorsed by both United States Secretary of State John Hay and President Theodore Roosevelt. Following the Civil War, several other Jewish families settled in the growing city. By 1900, Jacob Apfel, Benjamin Dreyfus, Simon Levy, Mayor Oppenheimer, Charles Wertheimer and Marx and Lazour Rouff located their families in the city and found work as clerks, merchants, and jewelers. Like the antebellum Jews that made their way to Texas, these families became involved in both the commercial and civic life of Victoria. German immigrant Simon Levy, who opened a dry goods business in 1870, was master of a local Masonic lodge. Jules Hexter, who served as president of Levi’s bank when it became state-chartered, was a vice president of the Reform congregation and served on the city council, as did Henry Halfin. Ike Cohen, a jeweler, served as the city fire marshal. Although the Jewish population numbered around 100 individuals, Victoria lacked a formal congregation until the end of the 19th century. 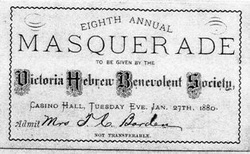 While they had met together informally as early as the 1850s, they did not organize until 1867, when Victoria Jews established a Hebrew Benevolent Society. The society held services and even joined the Union of American Hebrew Congregations for several years in the 1880s. In 1876, Jewish women had founded the Hebrew Ladies’ Benevolent Society, which had 17 members in 1900. They also founded a Jewish Children’s Aid Society in 1889. A chapter of B’nai B’rith, later named in honor of prominent Jewish grocer Max Bettin, was organized in 1875. Finally, in 1894, Jews in Victoria established an official congregation, which they named B’nai Israel. B’nai Israel was small in its early years, relying on traveling rabbis in the region. Rabbi Henry Cohen of Temple B’nai Israel in Galveston was the most influential of these visiting rabbis. The 1900 American Jewish Yearbook lists Godcheaux Levi as lay reader of the Temple B’nai Israel Congregation, but notes that he was under the supervision of Rabbi Cohen. By 1907, the congregation was meeting in a building they shared with the local Masonic Lodge. According to Sanborn Maps of the time, the synagogue was on the first floor, with the Masonic Temple on the second. By 1912, the congregation had acquired a building next door, which they used for their Sunday school. 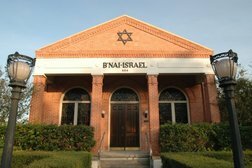 B’nai Israel was Reform, joining the Union of American Hebrew Congregations by 1905. Not all Victoria Jews belonged to B’nai Israel, which had 26 members in 1910. A small group of Orthodox Jews, most of whom were Eastern European immigrants, met together to pray in private homes. Grocer Max Bettin, who had come to Victoria in 1884, kept the group’s Torah in his home. B’nai Israel received its first full-time resident rabbi in September 1905. German-born George Solomon, an 1893 graduate of Hebrew Union College, had served a congregation in Los Angeles before coming to Victoria. He remained at B’nai Israel for only a year or two, leaving on account of the humid Texas climate. His replacement, Dr. M.M. Sessler was installed April 26, 1907. Highly respected by the community, Sessler had ministered to congregations across the United States, including: Oakland, California, Alexandria and Roanoke, Virginia, Opelousas and New Orleans, Louisiana, Wheeling, West Virginia, Providence, Rhode Island and Port Gibson, Mississippi. Undoubtedly, Sessler’s reputation preceded him, as the Advocate described Sessler as a “man of profound learning” with his sermons attracting “wide attention.” In one instance, Victoria’s Episcopal priest invited Sessler to present a sermon titled “When Will the Messiah Come?” His effective Sunday school practices received praise in a 1907 issue of the magazine Young Israel. After only a year, Sessler received a call to a prestigious Sumter, South Carolina ,congregation in August 1908 and left the city. George Solomon returned to his old rabbinate in 1912, before leaving again in 1915 for Lexington, Kentucky. Temple B'nai Israel. Photo by Jenny Solomon. ​The Victoria Jewish population peaked around 1920 at 120, near the time of the erection of the city’s first and only synagogue. Temple B’nai Israel, built in 1923, stands today at 604 North Main Street. Dedicated June 5, 1923 with Rabbi Henry Cohen officiating, the Jewish Herald describes congregation president Simon Levy with “tears of joy stream[ing] down his cheeks over this long anticipated happy occasion and his voice…stilled by his emotions.” Dr. Jack Kahn, who was an optometrist in Victoria for decades, and Selma Kleinsmith were the first couple married in the structure in October 1923. The new synagogue effectively served both the Reform and Orthodox Jewish communities following its construction. The rabbinate stood empty for over 20 years until 1936 when S.J. Schwab arrived. During Rabbi Schwab’s tenure, the congregation added an organ to the sanctuary. Schwab left for Laredo, Texas, in 1939, making him the last full-time rabbi to serve Victoria. In addition to lay readers, visiting and student rabbis led High Holiday services in the following decades. Rabbi Jimmy Kessler served as visiting rabbi from 1981 to 1988, when the congregation had 38 contributing members. While the overall population of Victoria grew freely throughout the 20th century, from 5,957 in 1920 to 60,603 in 2000, the Jewish population declined substantially, from 120 in 1918 to under 50 by the new millennium. Despite falling numbers, Jews still held prominent roles in the community. For instance, David Lack, a B’nai Temple president, founded Lacks, one of the largest furniture store chains in Texas. Harry Slotnick, another congregation president, held a variety of community positions, ranging from vice president of First Victoria National Bank to head of the Victoria Coin Club. Today, there are about 20 Jewish families in Victoria. Dr. Shira Lander, a Rice University religion professor, has lead High Holiday services as well as periodic Shabbat and education services. Despite a 2007 incident in which the Temple’s front was desecrated with anti-Semitic slurs, Victorian Jews remain welcome participants in the life of the city, and look to maintain their involvement and tradition in the coming years.